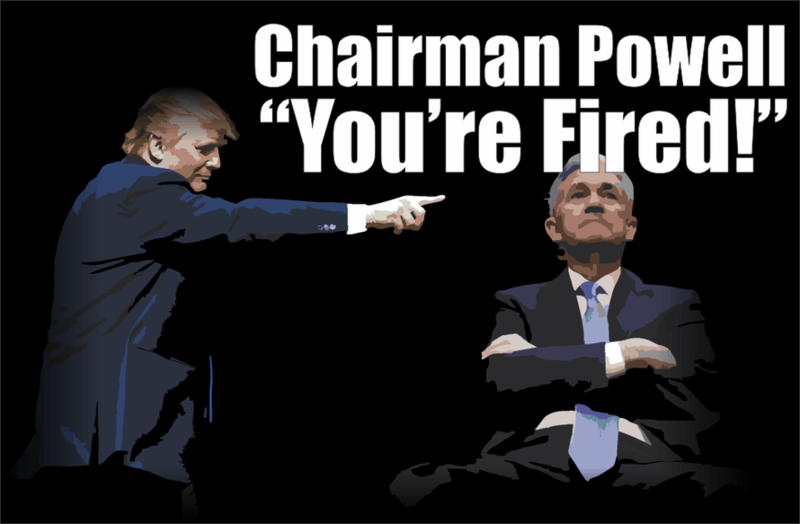 Chairman Powell - You're Fired! On numerous occasions, Trump has claimed the stock market is his “mark-to-market.” In other words, the market is the barometer of his job performance. We think this is a ludicrous comment and one that the President will likely regret. He has made this comment on repeated occasions, leading us to conclude that, whether he believes it or not, he has tethered himself to the market as a gauge of performance in the mind of the public. We have little doubt that the President will do everything in his power to ensure the market does not make him look bad. Almost a month later we learned that Kudlow was not just speaking for himself but likely on behalf of his boss, Donald Trump. During an interview with CNBC, on July 20, 2018, the President expanded on Kudlow’s comments voicing concern with the Fed hiking interest rates. Trump told CNBC’s Joe Kernen that he does not approve [of rate hikes], even though he put a “very good man in” at the Fed referring to Chairman Jerome Powell. “As of this moment, I would not see that this would be a big deal yet but on the other hand it is a danger sign,” he said. These comments and others come as the Fed is publicly stating their preference for multiple rate hikes and further balance sheet reduction in the coming 12-24 months. The markets, as discussed in our article Everyone Hears the Fed but Few are Listening, are not priced for the same expectations. This is becoming evident with the pickup in volatility in the stock and bond markets. There is little doubt that a hawkish tone from Chairman Powell and other governors will increasingly wear on an equity market that is desperately dependent on ultra-low interest rates. Who can stop the Fed? We think there is an obstacle that might stand in the Fed’s way of further rate hikes and balance sheet reductions. Consider a scenario where the stock market drops 20-25% or more, and the Fed continues raising rates and maintaining a hawkish tenor. The word “significant” suggests he would need to see evidence of such a move causing financial instability. “Lasting” implies Powell’s reaction time to such instability will be much slower than his predecessors. Taken along with his 2013 comments that low rates and large-scale asset purchases (QE) “might drive excessive risk-taking or cause bubbles in financial assets and housing” further seems to support the notion that he would be slow to react. President Trump’s ire over Fed policy will likely boil over if the Fed sits on their hands while the President’s popularity “mark-to-market” is deteriorating. This leads us to a question of utmost importance. 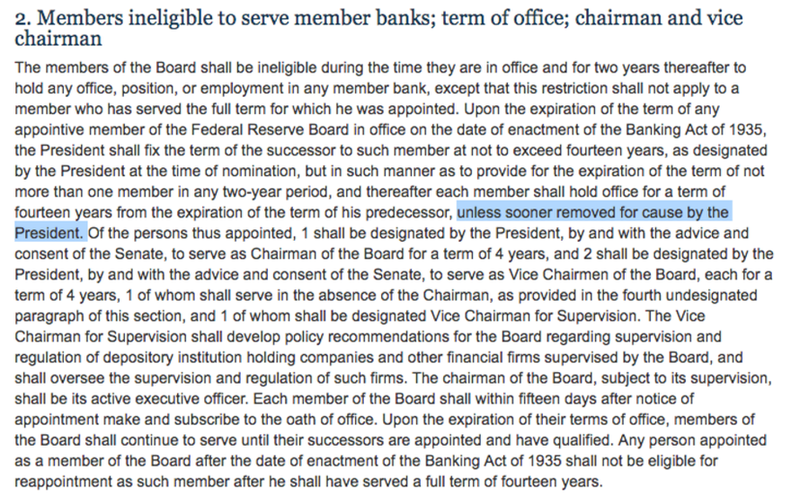 Can the President of the United States fire the Chairman of the Fed? If so, what might be the implications? Given that the President can fire the Fed Chairman for “cause” raises the question of implications were such an event to occur. The Fed was organized as a politically independent entity. Congress designed it this way so that monetary policy would be based on what is best for the economy in the long run and not predicated on the short-term desires of the ruling political party and/or President. Although a President has never fired a Fed Chairman since its inception in 1913, the Fed’s independence has been called into question numerous times. In the 1960’s, Lyndon Johnson is known to have physically pushed Fed Chairman William McChesney Martin around the Oval Office demanding that he ease policy. Martin acquiesced. In the months leading up to the 1972 election, Richard Nixon used a variety of methods including verbal threats and false leaks to the press to influence Arthur Burns toward a more dovish policy stance. Such a turn of events might initially be very favorable for equity markets, but would likely raise doubts about market values for many investors and raise serious questions about the integrity of the U.S. dollar. Lowering rates even further leaves the U.S. debt problem unchecked and potentially unleashes inflation, a highly toxic combination. A continuation of overly dovish policy would likely bolster further expansion of debt well beyond the nation’s ability to service it. Additionally, if inflation did move higher in response, bond markets would no doubt eventually respond by driving interest rates higher. The can may be kicked further but the consequences, both current and future, will become ever harsher.